A homeless guy named Charles is living in an alley behind a grocery store. Edwin, the owner, asks him kindly to move along, as he is scaring away customers. Edwin offers Charles some money, which Charles refuses. Edwin pushes the money on him, and in doing so, brushes Charles’ hand. He seizes and starts muttering “Daisy, come quick, not much time.” He apparently called 911, asking specifically for Daisy Johnson to save him from HYDRA. Luckily, SHIELD gets all incoming 911 calls, so they head to New York where they find Edwin talking to the cops. He recognizes Daisy, even though Daisy has never seen him before. He swears he saw this moment before, and thinks Charles put a curse on him. He knows of HYDRA because someone yells the word. Sure enough, a plane flies in, May yells “HYDRA!”and shots ring out all over the place. Edwin tells Daisy this is where he dies, and is shot through with bullets. HYDRA uses their claw game to school up Charles and fly away with him. Before they can take him away, Daisy makes a valiant effort to grab him. She misses, but her hand brushes against his, and she seizes, getting her own visions: Coulson shooting her; Lincoln covered in blood; FitzSimmons standing in the snow; Charles dying. She comes out of her reverie, scared, then realizes: it hasn’t happened yet. Back at SHIELD, Daisy describes what she saw, and believes she can reverse-engineer it to get there before the bad stuff happens. Fitz believes that what Daisy saw is set in stone, and proceeds to demonstrate spacetime for the other agents. Coulson’s plan: don’t let Daisy leave HQ; Coulson can’t handle a gun; and FitzSimmons can’t go into the snow. Since May wasn’t in the vision, she will be sent to save Charles. Coulson searches the records and finds homeless Charles is Charles Hinton, with a wife named Polly. They bring her in to find out what happened with her husband. According to Polly, Charles went outside to gather their daughter’s toys from a downpour, and he started to scream. Polly ran out to find him “crusty” and helped him up. She saw flashes of a horrible car crash. When Polly helped her husband into the house, she got more flashes, seeing Charles’ mom in a hospital bed. Both of them saw the visions and started to think they were going crazy. The visions came whenever Charles and Polly touched. Then the visions started coming true. Charles set out to try to stop the deaths from occurring, and that sent him over the edge into crazy town. He was powerless. Charles left because he could never hold his daughter without her screaming and crying in terror. Meanwhile, Ward is healthy and strong after ‘eating’ those humans. He wants to know why Malick brought him back. “My ancestors believed that if we returned you, we would be rewarded,” is the cryptic answer. Ward wants to know what it is that Ward could give him that Malick’s billions of dollars couldn’t. Then he realizes: true power. Ward and Gideon take a meeting with the heads of Transia Corporation, a company that holds patents on many cutting-edge exoskeletons that provide superhuman strength. The CEO is not interested in selling even a single share in the company. So they bring in Charles, who apologizes before he touches the CEO. In his vision, the CEO sees a particle cloud devour the skin of the other Transia executives like acid. Terrified, the CEO signs on the dotted line and begs them to leave. But Ward told him he would show him what would happen, not what could happen. Ward goes Hive and the feast begins. Malick’s team has already started to take over Transia, but Ward has a special task for Malick: to put on the exoskeleton prototype. He tests it by throwing a massive conference table across the room. But Ward wants him to feel true power: he wants Malick to kill the CEO. Malick grabs him, punches him, then crushes his head with his (almost) bare hands. Back at SHIELD HQ, Daisy has an idea. Since she knows what will happen when they go into the building, and who will be where, she walks May through an exact recreation, hoping she can shave enough seconds off to disrupt the vision. After spending an entire afternoon, May gets the rhythm down. Coulson preps his team for the “surgical strike,” with no communications in case HYDRA is listening. Suddenly alarms in HQ go off: there is an intruder. It is Andrew, still in human form, surrendering. He can feel Lash taking over and worries that his next transformation will leave him Lash permanently. He came to say goodbye to May. Coulson pulls May from the mission, much to everyone’s chagrin, and puts Daisy in her place, warning May that if she doesn’t say goodbye to Andrew now, she would regret it. With Daisy now in place, Coulson warns her that if things go south, she needs to get the hell out. Interestingly, he calls her Skye here, which Daisy corrects. I suspect that this will indicate an upcoming neurological problem with Coulson. Fitz finds a pirated wifi signal he taps into so the rest of the group can have a visual of what is going on at Transia. Unfortunately, the transmission is unstable. Before it cuts out, they get a glimpse of Ward. Everyone on the bridge freezes. Daisy, blissfully unaware, moves through the perfectly-rehearsed movements all before the security agent manages to hit the alarm. Before she can be too proud, the alarm goes off anyway. Then she realizes there is a two-way mirror in the room, with someone on the other side. 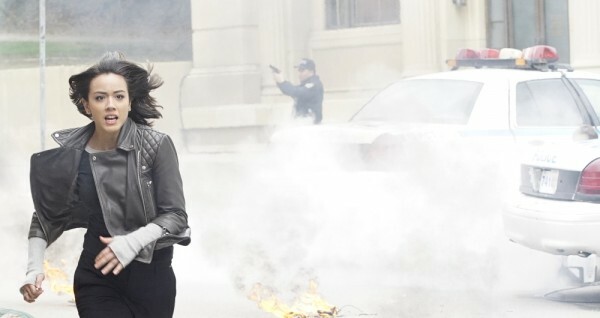 Coulson appears behind her and shoots – not at Daisy, but at her reflection. The glass breaks, and the goon behind it is dead. 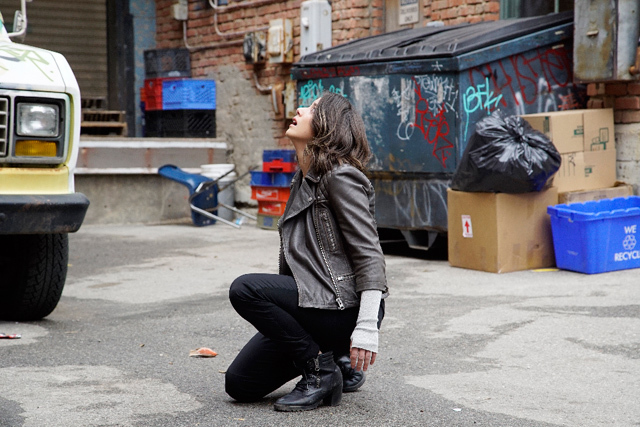 Coulson sends her to the roof to try to save Charles, while Coulson goes to find Grant Ward. Much like her teammates, Daisy freezes. “Yeah, day got weirder,” Coulson confirms. Lincoln comes in with a few nameless tactical agents, and they spread out, looking for Ward. FitzSimmons stays outside of the fray. Up on the roof, Daisy finds Charles, but is knocked out by Malick and his supersuit. She tries to blast him with her superpower, but is too disoriented and misses. He starts beating her, ruminating on the intoxicating power of power. Charles steps in and touches Malick’s neck. Malick seizes as he sees his visions of death, then turns his power to Charles. This allows Daisy enough time to get her wits about her and zap Malick with a quake field. Malick is knocked out, and Charles drops beside Daisy. He isn’t dead yet, but he is pleased: he finally made a difference. With his dying breath, he begs Daisy to protect his daughter, in case she has the same affliction. She promises. Before he dies, Daisy lays a hand on Charles, so he can have a final moment of human contact. She sees another vision, this one of the space capsule we saw a few episodes ago. Floating within the capsule is blood, a cross pendant, and a SHIELD uniform. Back at HQ, May sits with Andrew in the containment unit. He is being infused with Simmons’ potential inhuman vaccine, to see if it has any effect. Andrew is concerned that there is some Lash in him, and some of himself in Lash, which was why May was able to reach him that one time. Although he wishes he could change the past, he feels like he was fighting for a cause he didn’t understand. If he is going to go full Lash, he wants to be in SHIELD’s containment. Unfortunately, the vaccine doesn’t seem to have an effect. Andrew starts to change and locks himself in another room. He changes fully. Ward and Giyera are alone, and Ward instructs Giyera to “go there,” that the exoskeleton is not the tech they are interested in. Malick calls and warns Giyera that he is to be at his side at all times – not Ward’s. Malick is in a helicopter, and looks frazzled. Giyera tells him he is right where he is supposed to be and hangs up. To Ward, he admits that Malick sounds afraid. You can watch a preview for next week’s episode, titled “Paradise Lost,” using the player below.